Native plant nurseries face different challenges than traditional forest and conservation nurseries. They must educate their customers to the practical limitations of propagating native plants such as the poor availability of seeds or vegetative propagation material. The unusually long amount of time to collect propagules, treat seeds or cuttings, and grow the seedlings emphasizes the need for crop planning well in advance of the outplanting date. The concept of “source-identified, locally-adapted” planting stock must continually be stressed when dealing with native plant customers. New products mean new markets so nurseries should try to produce a range of species and stock types and show them to prospective customers. 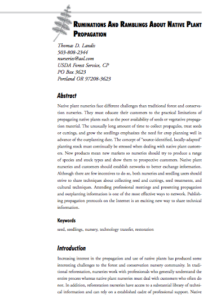 Native plant nurseries and customers should establish networks to better exchange information. Although there are few incentives to do so, both nurseries and seedling users should strive to share techniques about collecting seed and cuttings, seed treatments, and cultural techniques. Attending professional meetings and presenting propagation and outplanting information is one of the most effective ways to network. Publishing propagation protocols on the Internet is an exciting new way to share technical information.